If you follow my social media, you may have seen that I was nominated for three Rondo Awards this year! But in case you haven't, I just wanted to spread the word on ye old blog, with a little info on how to vote. Let me begin with the nominations themselves. I have to admit, it was really great to wake up last Friday morning and see my name all over the ballot. It means a lot and I feel so honored to be listed in the following categories, because the competition is wonderful! 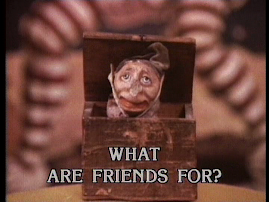 You can look at the ballot for the Rondo Awards, and send your votes to taraco@aol.com. OK, I haven't won anything, but seriously, thanks to the folks who nominated me! I won't go into too much about why each nomination is really important to me, but let's just say talking to people (whether in person or even on a podcast) has always been a nerve wracking experience, so to see the support from the horror community that I'm doing OK at some of these things just really means a whole heck of a lot. So, big thanks to any and everyone who listens to, or attends anything where you have to hear me jabber for a couple of hours. It's been great and I truly appreciate each and every one of you, even if you don't vote for me (but you know, vote for me). There are so many great podcasts, commentaries and events to choose from, so go look and vote with your heart! Also, if you haven't seen, I was recently interviewed by the Los Angeles Times in a piece all about TV movies! You should check it out! One more piece of Made for TV Mayhem news. 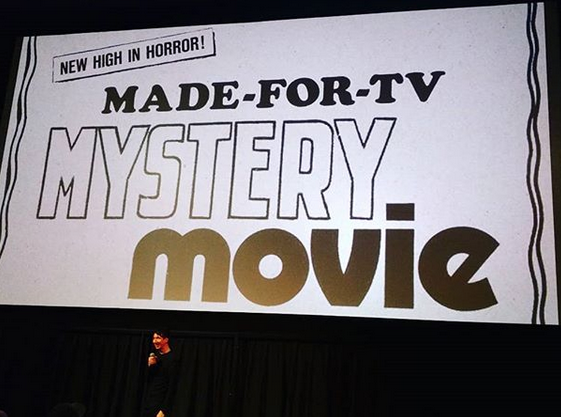 I've opened up an Instagram account (@madefortvmayhem) which will hopefully allow me to add a more visual aesthetic to what I'm already doing on facebook and twitter. Come and follow me, please! I'm just getting started, but I have tons of TV Guide ads, as well as some promo pics and screen grabs that I'm dying to share on a more regular basis. Plus, it will serve as another place to update everyone on podcast episodes or new blog posts or any other kind of related news. 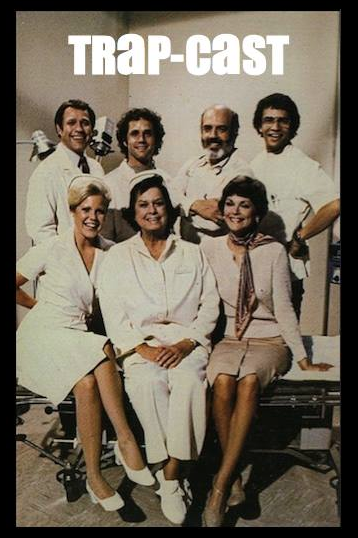 And finally: I think I'm actually almost done with my intro episode to The Trap-Cast, which is just going to be a monthly series of minisodes dedicated to the show Trapper John MD! It's time, guys. Thanks to everyone again! 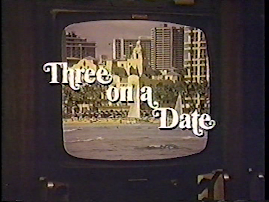 I've actually half-written two reviews for this blog, so I hope I can find a little time to finish them. Til then, I have more exciting news coming soon... So please keep tuning in! Thank you! I just gave my third Miskatonic Institute of Horror Studies talk on February 7th. 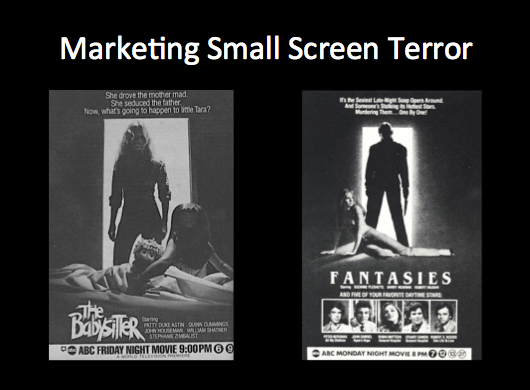 Again, it was all about TV genre movies, but since it was longer than my talk in London, a few things have changed. Also, please note that I DID NOT update this list with my lecture in New York City, so this will be slightly different from that talk, but closer to it than the one in London (following this, cuz I am not sure I am!). Anyway, here's what was discussed and seen. And again, big thanks to Kier-La Janisse and the fine folks at the Philosophical Research Society for hosting such a great event. And I'm also throwing a lot of gratitude and love towards the audience who have been incredible at all of my talks. Thank you, thank you, thank you!!!! Subtopic: That's a Pilot TV Movie?! 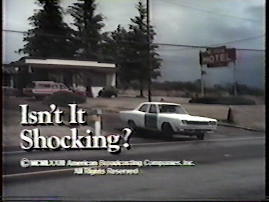 John Badham: It's it Shocking? 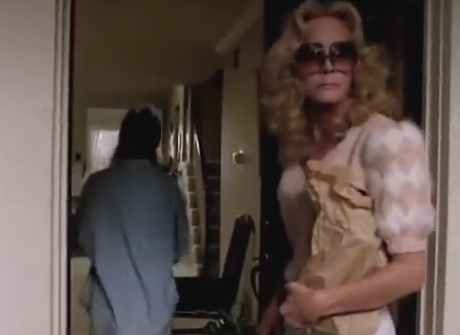 John Carpenter: Someone's Watching Me! TOPIC: THE 90s and Beyond! 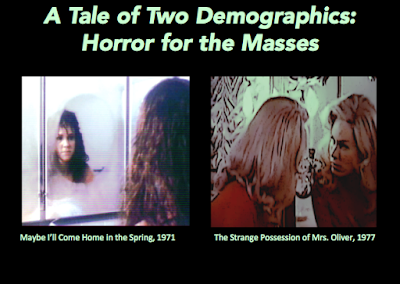 Subtopic: Mother, May I Sleep with Demographics? When Percy MacKaye wrote his play The Scarecrow in 1908, he only meant for his audience to make the loosest connections to its obvious inspiration, Nathaniel Hawthorne’s short story Feathertop. Admittedly, even MacKaye would have a hard time denying the liberal doses he borrowed from Hawthorne’s story about a witch who creates a man out of a scarecrow, sending him off to woo a wealthy, impressionable young woman. But, it is in the metaphor itself that MacKaye drew on something distinct, softening Hawthorne’s condemnation of the class system and of humanity in general. Hawthorne’s work was often heavily tinged in the surreal, and Feathertop is no exception, mixing supernatural mischief and morality in a way that made the story unique and still oh-so-Hawthorne in the commentary. Feathertop sought to expose people for what they were, and to recognize the irony with which they live their own life, as well as how they choose to judge others (Hawthorne uses the word “trash” to compare the makeup of the scarecrow and that of the human race). Ending the tale with Feathertop returning to its original scarecrow form, Hawthorne surmised that an inanimate object was better off in effigy than had it continued to live as a man. However, MacKaye went down a far more sentimental route, making our scarecrow (named Lord Ravensbane in human form) a sympathetic and sad character whose happiness is only derived when he dies a mortal man. 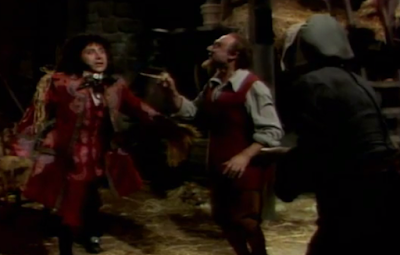 The 1972 Hollywood Television Theater production of The Scarecrow upholds the poignancy of MacKaye’s tale. Although, it also highlights some of the whimsical satire Hawthorne embraced and which MacKaye slyly inserted. 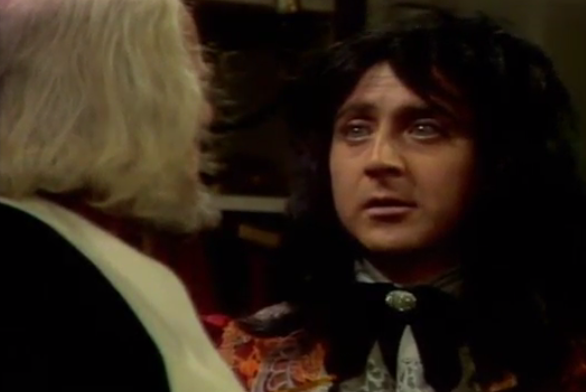 It is most noted in a party scene where the upper echelon are eager to welcome Lord Ravensbane’s eccentric character into their wealthy fold, but then are just as quick to disown him, even when the truth of his original form leaves him heartbroken and humiliated. Hollywood Television Theater was a series that aired on local PBS affiliates throughout the United States from 1970-1978. 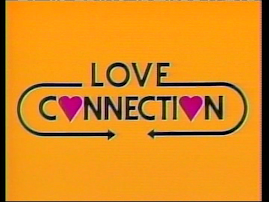 It was conceived by KCET in Los Angeles and that channel capitalized on its location and accessibility to recognizable faces, casting several high profile actors to appear in their productions. Their debut adaptation of The Anderson Trial starred William Shatner, and Martin Sheen (and was directed by George C. Scott!). 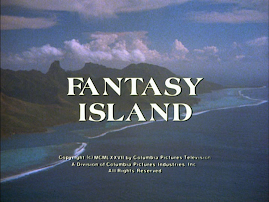 Other productions featured Earl Holliman (Montserrat, 1972), Joseph Bottoms (Winesburg, Ohio, 1973) and David Hedison (For the Use of the Hall, 1975). 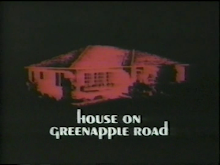 According to Adapting Nathaniel Hawthorne to the Screen: Forging New Worlds, this series sought to give audiences an alternative to the cookie cutter world of television of this era. They brought all kinds of heavy hitting playwrights to the show, including Anton Chekhov (Two By Chekov, 1972) and Arthur Miller (Incident at Vichy, 1973). 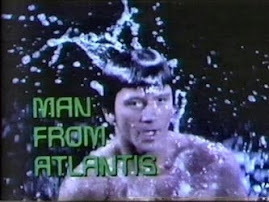 The directors were often well known journeymen such as Boris Sagal, who directed this entry, but actors, like the aforementioned Scott came into the role too, and prominent performers such as Lee Grant (For the Use of the Hall), and Rip Torn (Two By Chekov) took on the heady productions. Sagal was a Russian born filmmaker who moved from theatricals to telefilms to episodics on a regular basis. With this production, he keeps things simple, while adding shades of flair along the way. 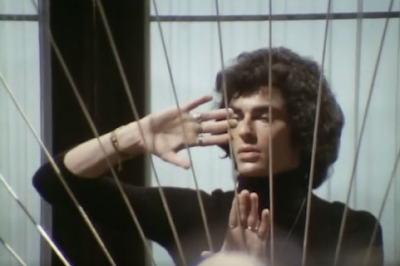 Since it wasn’t shot in front of a live audience, the director threw in a few simple effects that, along with its muted shot-on-video pallor, give the play a substantial measure of filmic surrealism that keeps the viewer a little off-kilter as the play progresses. At this stage in the history of PBS, the network found itself under fire by certain politicians who thought too much government money went into producing television (sound familiar?). So, PBS sought out a mawkish and mainstream title, and The Scarecrow is now considered one of the lesser adaptations to come out of the series. However, it was also a sorely needed entry, balancing out the edgier fare to appease the mostly upper middle class audience’s more conservative ideologies. It’s a bit ironic that this play sometimes lampoons the types of people most associated the PBS viewership, and also most known for condemning it. The critics at the time were mixed on their thoughts. Henry Mitchell of the Washington Post wrote, “Nothing in the play is very far developed or very carefully worked out, and the sad result was a shiny-wrapped but none too meaty TV dinner, half-baked.” Conversely, Cecil Smith of the Los Angeles Times quite enjoyed it, calling The Scarecrow a “stunning production” that stepped out of “academic mustiness.” However, Smith also criticized the plush production as maybe a little too expensive for what is intended to be a modest television series, thereby giving greedy politicians a decent arguing point. 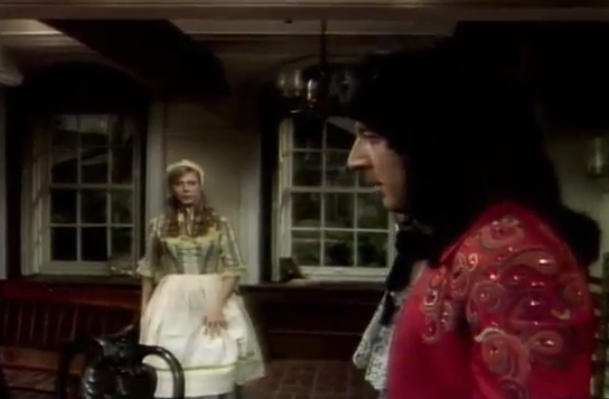 Certainly some good money went into the absolutely magnificent cast, which features Blythe Danner, Will Geer, Norman Lloyd, Nina Foch, Elisha Cook, Sian Barbara Allen and an electrifying Gene Wilder as Lord Ravensbane. Wilder’s physical take on manifesting from his original scarecrow state to that of a man, and learning to grow emotionally in that capacity is spellbinding. The scene where he attempts to call out to his mother is both disturbing and sympathetic. And although Ravensbane is definitely the oddest ball in the house, it’s easy to see how the vulnerable and sensitive Rachel (Danner) could fall for his quirky charms. Pete Duel plays Ravensbane’s nemesis Richard Talbot, the man who has already claimed beautiful Rachel’s hand. Duel is the most under-the-radar actor in the cast, and his delivery feels more tailored for television, as compared to the bigger performances. But it is exhilarating in its own way, anchoring some of the play’s more outlandish moments. There’s also a touch of relatable humanity there. Talbot is jealous but logical and thoughtful, and by the conclusion, empathetic towards his enemy, and ultimately there for him at the end. It’s an interesting yin-yang relationship that could have been explored on a deeper level. Nevertheless, the end product is both intriguing and delightful. At times a little posh and chaotic perhaps, but also earnestly produced, and extremely well acted. 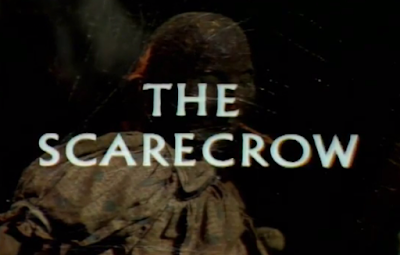 It might lack the morality lesson of a Hawthorne classic, but in an era of unrest and during the Vietnam War, The Scarecrow offers audiences a chance to realize that humanity is a virtue and yes, the scarecrow doesn’t just have a brain, he also has a heart. This blog post was inspired by an upcoming Australian film journal from Lee Gambin and his film collective CineManiacs. 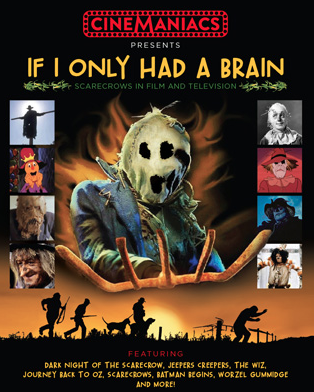 The first issue is dedicated to scarecrows and I wrote about Dark Night of the Scarecrow, and interviewed Jeff Burr about his direct-to-video slasher Night of the Scarecrow. Keep an eye on my social media channels for updates on the release of the journal! Just popping in a with a little news. Also, do you have a cup of sugar I could borrow? Have we talked about the Rondos yet? I can't remember. I didn't win, but did get an honorable mention, which was amazing. Thanks to everyone who voted for Are You in the House Alone? 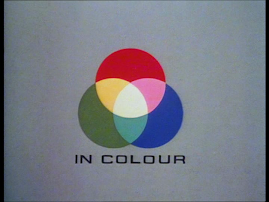 A TV Movie Compendium: 1964-1999. Your support has been amazing. Hey guys, one of the most exciting things ever has happened! I have provided a commentary track for Scream Factory's upcoming blu ray release of the classic John Carpenter telefilm Someone's Watching Me! Can I say OH. MY. GAWD. I mean, I just did, but OMG. I'm so excited. The release date is July 24th, but you can pre-order through Scream Factory's site and get it a couple of weeks early! I hope everyone enjoys it. I honestly gave it my all. It's not just an important film because it's early Carpenter, but Someone's Watching Me! is also simply just an amazing movie. And one that deserves all of the love in the world. Also, I'm on the same disc as Adrienne Barbeau. That's it, I'm done! My life is complete. Thank you so much Scream Factory for allowing me to be a part of this! The people at Scream Factory are amazing. It's been wonderful. Turns out the very center of hell is kind of awesome. Wes Craven 4lyfe! In other amazing Amanda news, Arrow's blu ray release of The Last House on the Left was pushed back by a few weeks, but copies have started trickling in all over the world. As you may recall, my good friend Bill Ackerman from Supporting Characters and I contributed a commentary track. The early reviews have been really nice too, which is very exciting. I'm a newbie to the world of commentaries, but I can tell you it's really one of those things you put your heart and soul into because you want to give the film a lot of love and also keep people interested in you for 90s minutes. That's no easy feat, guys. So, even the mild criticism is fine as long as people appreciate the work you put into these things! Anyway, that's my roundabout way of saying be kind if you review it on Amazon or anywhere else! We work hard on these things, and I'm honored to be a part of them. You can pick up Last House in the UK via Arrow's website, or through Diabolik if you are in the states. I have also contributed the liner notes to Arrow's upcoming blu ray release of Doom Asylum! Super excited about this. My booklet will only be available on the first pressing so grab a copy now. I will say this, writing liner notes for this project was absolutely one of the most fun writing assignments I've ever had. I was surprised by the amount of information I unearthed... turns out Doom Asylum has been well documented over the years, and it has a fascinating history. It's also super exciting because The Hysteria Continues provided the commentary track for this release as well. So, I'm in wonderful company. And, I just want to send a lot of love to Arrow for trusting me with Last House on the Left and Doom Asylum. They are a great company full of great people, and I'm so honored to be included somewhere there in the mix! 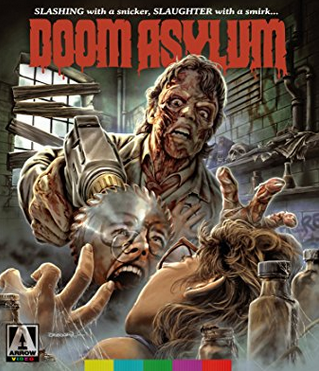 Again, you can pick up Doom Asylum via Arrow's website if you're in the UK or state-siders can go to Diabolik! 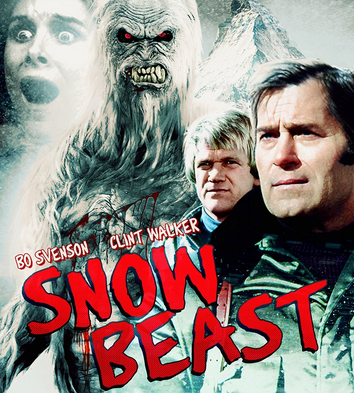 And speaking of liner notes, I also provided some for Retromedia's release of Snowbeast! So, as a company that doesn't normally do liner notes, it's an extra honor, but also something to note because to fit it properly into the packaging my writing has been placed on the opposite side of the insert, so remove the cover if you want to read about Bigfoot and stuff... Again, this was one of the most fun writing projects I've ever had. I'll tell you, liner notes are just a big ball of awesome to work on. 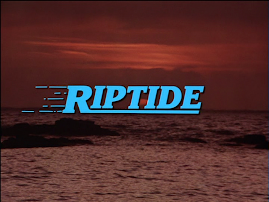 I'll never get tired of documenting lost and/or underrated films. I'm so honored people let me do it too! So, thank you, Fred Olen Ray for allowing me to participate in this release! 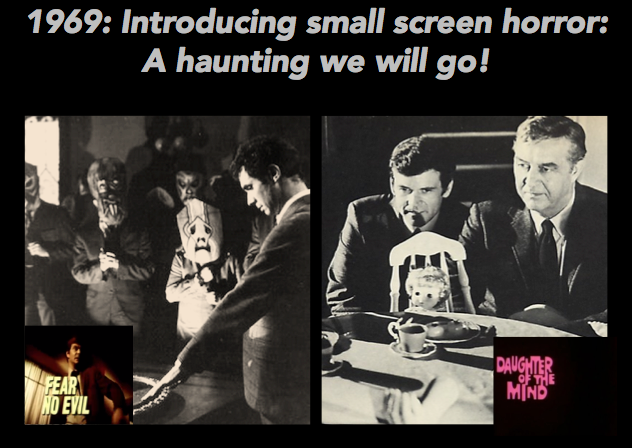 And check out the commentary he does with David DeCoteau! Good times had by all, to be sure! By the way, a little while ago I wrote about the blu ray release of The Master for Diabolique. Read it if you are so inclined! 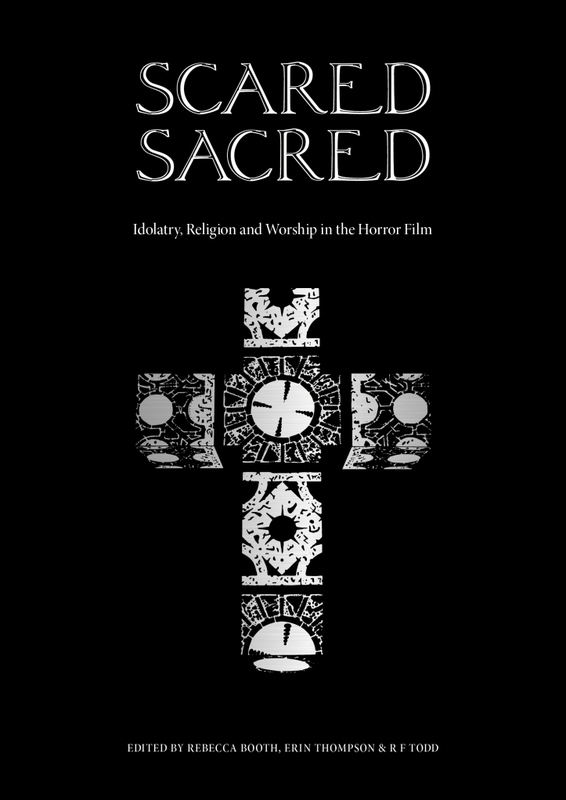 I'm also involved in an upcoming book titled Scared Sacred: Idolatry, Religion and Worship in the Horror Film! 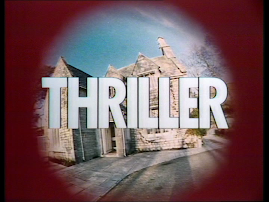 I'll be writing about two fascinating telefilms, which will be announced via House of Leaves Publishing in the coming weeks. 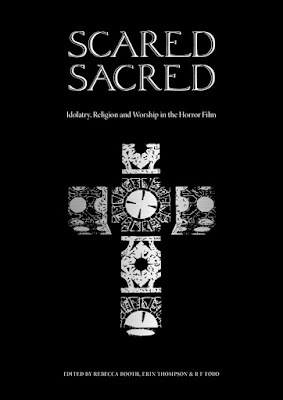 For now, check out the Rue Morgue and Anatomy of a Scream articles, as well as the HoL page which is set up for Scared Sacred. There will be a crowdfunding campaign opening up in the coming weeks, so keep an eye out! I'll also be submitting or have submitted several essays for a few more projects to be announced in the future. And I may or may not have more commentary news for you soon! Most of it is TV movie related, so yay! 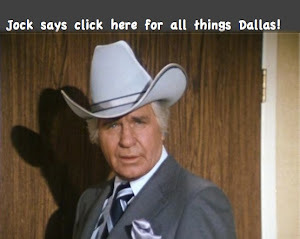 I might not be able to update my blog, but I'm doing my best to keep the TV movie love alive. There's been so much positivity coming from both strangers and friends alike, so I hope everyone knows how much I appreciate every kind word, like and share. Thank you! I'm exhausted, but undeniably glamorous! I'm so sorry I haven't been able to keep things moving on my blog in the ways I'd like, but I have lotsa news that I'm, like, crazy excited about! I guess we'll do the time sensitive stuff first: If you are in San Antonio or can get to San Antonio on Saturday, March 3rd, please come see me at the San Antonio Pop Con. 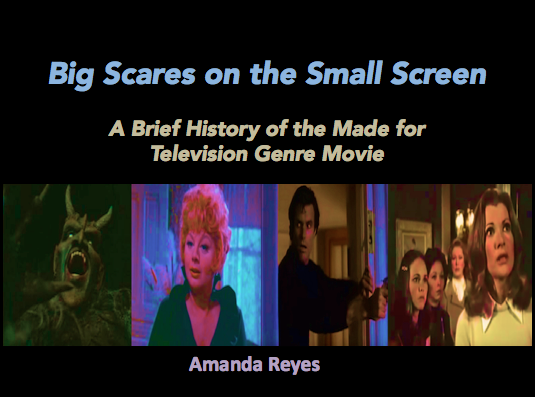 I'll be giving a presentation on Made for TV movies at 1:30, and then I'll be signing Are You in the House Alone? 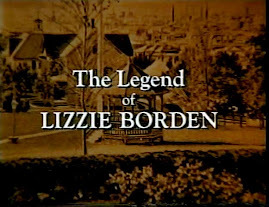 A TV Movie Compendium: 1964-1999 for the rest of the day. It's a free con put on by the local library and it looks amazing. Check out the presentation schedule here. I am thrilled to announce that not only did Are You in the House Alone make Barnes and Noble's Best of Horror list for 2017 (OMG! 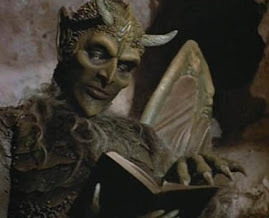 ), but it has been nominated for Book of the Year at the Rondo Awards! If you find you must vote for another book then follow your heart, but I think you should all make sure that you've checked off The Twilight Zone Podcast in the Best Multi-Media Horror Site category. Tom always does his best to put together an A+++ show and he deserves an award for all of his hard work (plus, dat voice... **drooling**)! 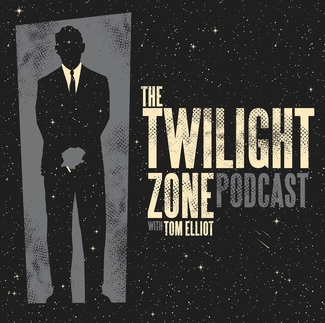 Make sure you vote for the TZ podcast called The Twilight Zone Podcast... there's another TZ show on the list (which I'm sure is wonderful, but still... Tom should win!). Tom even made a post where you can just cut and paste his entry into an email. Easy peasy. Do it! 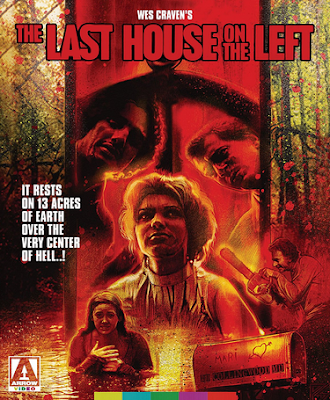 In non-TV news: Arrow Video announced last Friday that they are releasing a US/UK Blu Ray of Wes Craven's first horror film, The Last House on the Left, which my good friend Bill Ackerman (Supporting Characters) and I are providing a commentary track for! I am still pinching myself. I think many of you know that I'm a diehard Craven fanatic, so this opportunity has been a dream come true for me. Last House is due to be released in May, you can pre-order via Diabolik if you are in the US or through Arrow for you UK folks. 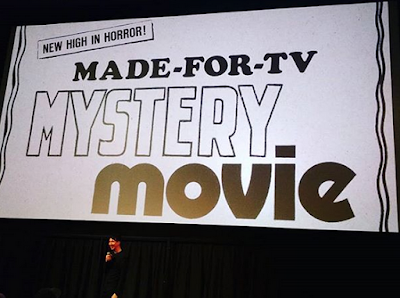 I did my first Made for TV Mystery Movie screening at the Alamo, and it was sold out! 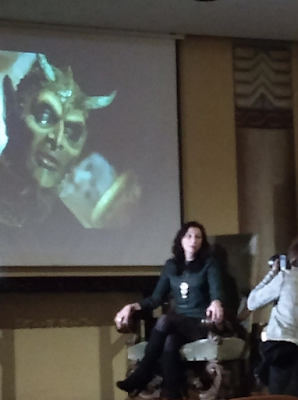 The evening and event were so amazing, and I'm beyond grateful for the chance to share my love of TV movies with people. I'll be doing another one in April and will share the link to buy tickets via my social media when they become available. On March 2nd I'm hosting the AGFA Secret Society screening. It's sold out, and I'm just mentioning cuz I'm excited. By the by, if you haven't had a chance to check out the Made for TV Mayhem Show, give us a go. 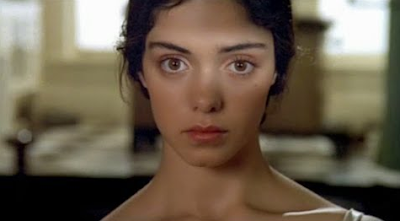 We'll be talking Kathleen Beller telefilms in March. Join us. 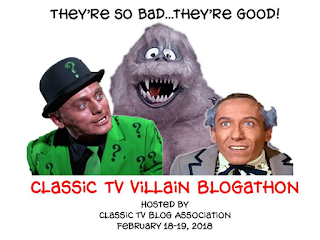 So, now you can see why I'm not around as much (but did you see I posted a review of Madame Sin as part of a recent Classic TV Blog Association blogathon? ), but I'm doing my best to keep the love alive! You can always visit my social media if you want to talk TV and horror. 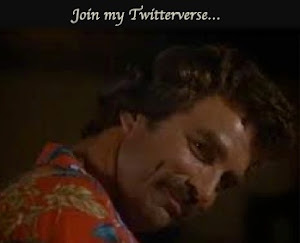 I'm on twitter @madefortvmayhem and my facebook is simply Made for TV Mayhem. Say hi! I may or may not have more news for you in the near future. But hopefully soon (Amy, soon)!!! Absolutely every single one of you that I've run across in person and online has been so supportive of what I'm doing. Thank you!!! 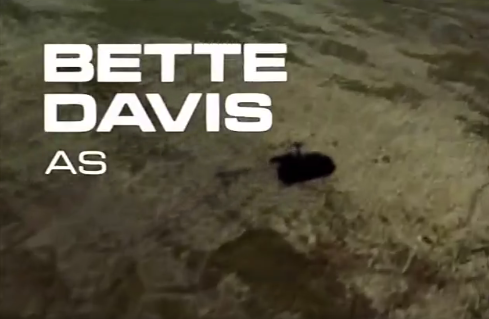 In her initial movie for television, Bette Davis is a ruthless, all powerful mystery woman who abducts an ex-CIA agent and forces him to help her steal an ultra-modern Polaris submarine. Thank you Alvin, this gets us started. I mean, sure that description is outlandish, but where does the bonkers come into play, you ask? 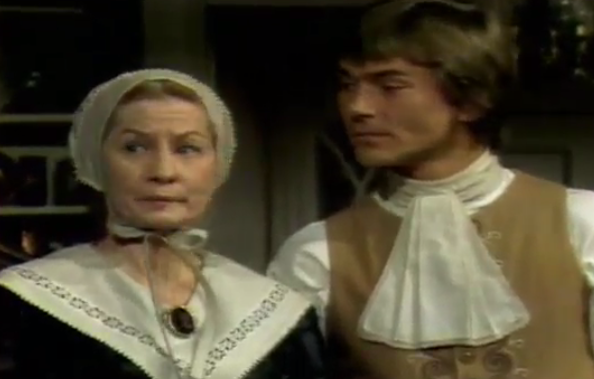 Well, first of all Davis is a half-Asian evil-doer residing in a Scottish castle. She has holograms of musicians playing enormous round harps, and her underground laboratory looks like the sinister workings of a Progressive auto insurance advert! 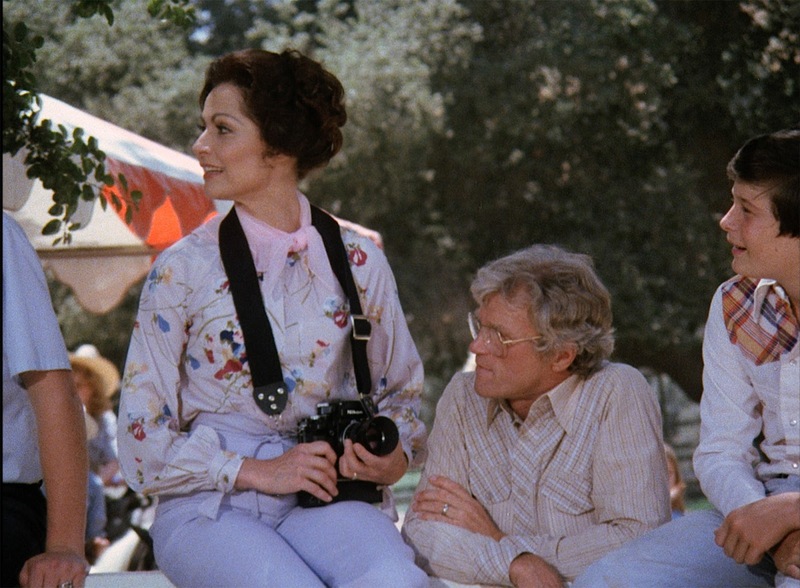 To help her along the way is the aforementioned CIA agent, Anthony Lawrence (Robert Wagner). He’s kidnapped somewhere in London by two women dressed as nuns who use the aid of a strange sound wave machine to throw Lawrence off his game. Out of sorts, he is flown to the castle, where he’s manipulated by a new programming device that works almost like a dog whistle, but with human-recognizable sounds. Turns out Madame Sin once had a tumultuous affair with Lawrence’s father and feels she can influence him with her familiar ties. 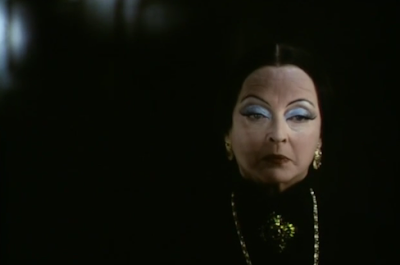 To a degree this works, but the wicked Madame can’t stop herself from resorting to even dirtier tricks, which involve manipulations so wonderfully evil that it would impress the likes of the greatest small screen love-to-hate-them villains (JR Ewing, I’m looking at you!). And don’t forget, she delivers these emotional and physical blows to her opponent complete with false eyelashes and the bluest eye shadow I have ever seen! The fab obviously elevates her duplicity another notch. Evil never looked so strangely fab! 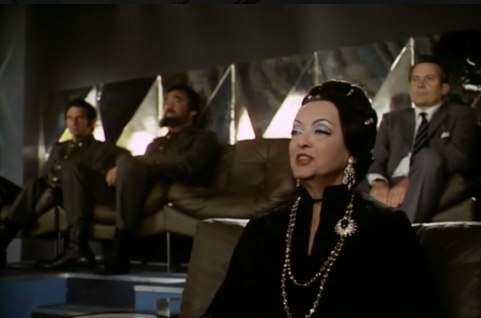 Madame Sin commits all kinds of villainy, from faking deaths, to stealing and selling submarines for 1 billion dollars. But she’s at her best when she’s remembering her love affair with Lawrence’s father. She makes jokes no one quite gets ("we spoke only in Croatian!" har har?) and frankly, gets all bent out of shape that her lover never mentioned Miss Sin to his son. So, what does she do when she gets mad? She renders Lawrence deaf and throws him to the wolves of Scotland, which is really just a bunch of tourists who don’t want to be bothered with helping anyone. Evil, I say! I'm here all week, guys. 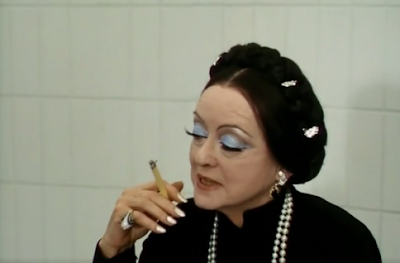 As mentioned in Marill’s concise review, Madame Sin marked Bette Davis’ small screen movie debut. 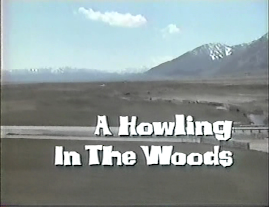 This TVM has an interesting history in that it was sold as a pilot film for a sadly unrealized US series, but was scheduled to play theaters overseas. Watching the unfortunate fate of Lawrence, one has to wonder if the series was meant to star Wagner at all, or if was going to follow the exploits of the great Madame (OMG. What did we miss out on?!?). Life is good when you're this wicked! True to her words, Davis looks like she’s having the time of her life. 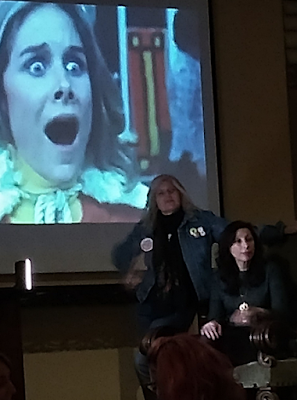 And that sense of fun isn’t just contained by Davis’ extravagant performance (complete with one of the best sashays I’ve seen in a long time. In short, she’s werking! 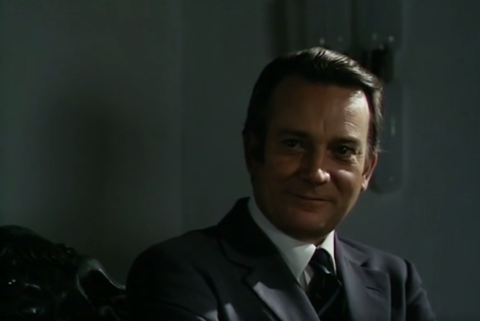 ), it can also be seen in the great Denholm Elliot, who plays her right hand man, Malcolm. He actually seems to be having even more fun than Davis (and was probably just giddy being in the same room with her). It’s impossible not to notice that subtle half grin that appears with some of his best dialog delivery! Madame Sin: It’s so disappointing to beat men. They never admit when they’ve lost. Unlike myself. But I’m never faced with the problem of losing because I always win. Malcolm: Well I’m with you. That is if I understand you correctly, which seems highly improbable. While the film can seem a bit campy with its strange premise and flamboyant dialog delivery, it had some serious money behind it. 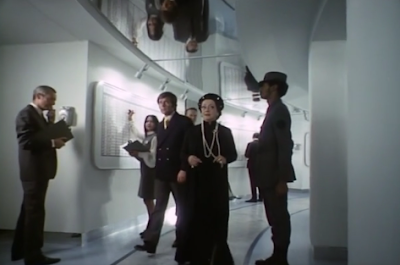 Davis’ simple yet outrageously gorgeous wardrobe was designed by the great Edith Head, and aptly places Miss Davis in head to toe villainous glamour! 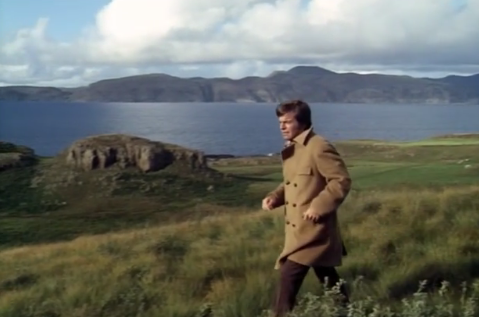 Madame Sin was shot mostly around London and at the famous Pinewood Studios, with some other exteriors shot on the Island of Mull in Scotland. Madame Sin’s gorgeous castle came courtesy of Glengorn Castle (aka Castle Sorn). The acropolis is not just a tourist attraction, it’s now a bed and breakfast! 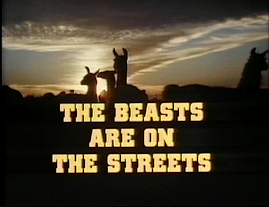 * In short, this film is an oh-so-70s feast for the eyes, and a mind-blowing treat of strange, and wonderfully bizarre filmmaking. 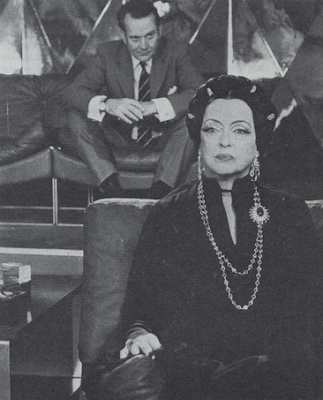 While it isn’t a copycat of Wagner’s 1967 TVM How I Spent My Summer Vacation, that colorful and awfully fun comedic spy thriller would make a fantastic double bill with Madame Sin! 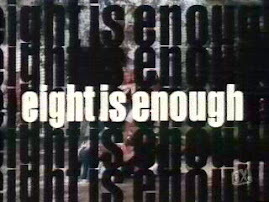 Unfortunately, despite the positive press the film received while it was in production, London critics weren’t so kind with the final product. 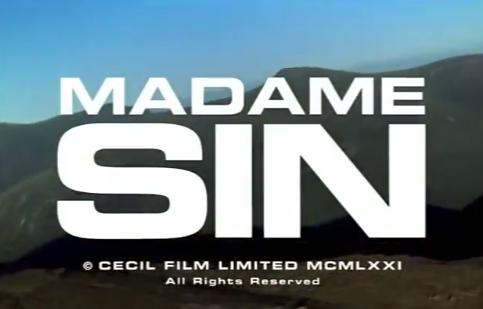 Richard Combs of London’s Monthly Film Bulletin remarked that Madame Sin suffered from a “dull script, a wooden hero and an abysmal ending.” The film opened at the Astoria in London’s West End and pulled in a respectable but only “Okay” box office of $8,556 (according to Variety). 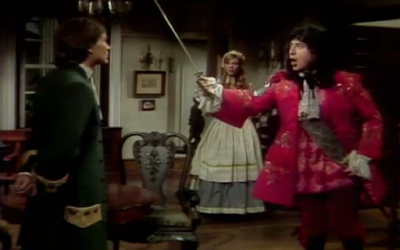 It was the replacement for Anthony and Cleopatra, which had grossed half as much the week before. Therefore, I call it a success! Its premiere on American television went over much better critically, although Davis’ TVM debut didn’t set the world on fire (shame on us!). Kevin Thomas of the LA Times said Madame Sin was “lots of fun,” and he enjoyed the “handsome production.” Still, the ratings were average, and the TVM drew an 18.4/24. Not horrible but much like its West End run, it was only OK. 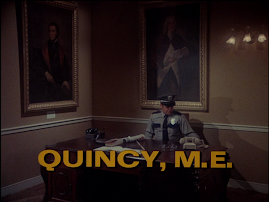 This was actually just one of two pilot movies Davis shot around this time. 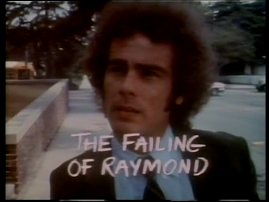 The other was The Judge and Jake Wyler (NBC, 12/2/1972), which was a Levinson/Link telefilm (they created Columbo). Davis tones down the glamour in the role of “The Judge,” and doesn’t spend much time doing much of anything except talking the phone. Of course, Davis’ star shines in any role, but if I were to pick one show to go to series, it would be hard to turn down Davis’ unforgettable strut as the evil Madame Sin. This blog post is part of the Classic TV Blog Association's Classic TV Villain Blogathon. Get the full list of participants with links to their articles here. And, enjoy! *And thank you to Gore Blimey from the Trilogy of Terror podcast for helping me with information regarding Glengorn Castle. You're the best! 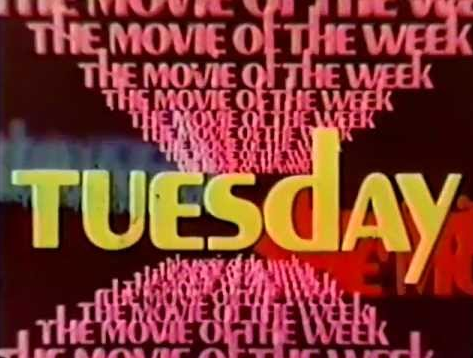 The Alamo Drafthouse's Terror Tuesday Presents The Made for TV Mystery Movie! I'm Co-Presenting Too! Hooray! OK, so the title pretty much tells you all you need to know! But just to reiterate, I was asked by Joseph Ziemba of the Alamo Drafthouse if I'd like to help him program some mystery tele-terrors every few months as part of the Terror Tuesday programming (normally held at their Ritz Theater location). Well, of course I would! Our first screening is January 30th, 2018, and you can get all the details here. There's not much else to say, except that I'm thrilled and honored. And if you are in the Austin area, please come by and say hello. I can't reveal what the first film will be, but I do think you'll love it! Ummm... can we just call 2017 the Year of the TV Movie? 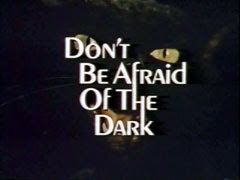 With the release of The Spell, the announcement of The Burning Bed coming out and Music Box Films/Doppleganger Releasing, uh, releasing the most excellent Wes Craven joint Summer of Fear on Blu-Ray, it seems that the oft-maligned telefilm genre is getting its due, and with all kinds of neat bonus features... The love! Of course, I'm an obvious champion of these movies, and have a particular soft spot for Craven's small screen flicks. I wrote extensively about them in an essay I penned for my book Are You in the House Alone? A TV Movie Compendium: 1964-1999, and I've also reviewed his big three telefilms here, if you want to read my thoughts on Summer of Fear (and Invitation to Hell and Chiller... and you can listen to a podcast episode dedicated to these films as well). I'm so pleased this film is getting a second chance at a new audience, and I should mention it comes with the original Wes Craven commentary conducted on the TV movie's original DVD release from a few years ago. So many great tidbits coming the master himself, a new interview with Linda Blair, and a gorgeous new transfer of a great film! Hooray! Lisa Holmes, the Director of Sales, Home Entertainment of Music Box Films/Doppleganger Releasing took some time out to discuss the release, which is today, y'all. Go pick up your copy (link above), and leave a review! Amanda Reyes: Why did Music Box/Doppelganger decide to release Summer of Fear? Lisa Holmes: We saw it as a diamond in the rough, and a great way to start a new direction for the Doppelganger Releasing label. If you look at our catalog, you’ll see that we gravitate toward what I like to think of as a little interesting and different. Summer of Fear fit that bill for us. AR: It's fantastic that you were able to acquire the original commentary that Wes Craven did for the DVD release in 2003. Out of curiosity, I'm wondering if it is difficult to procure previously released extra materials that were done for another distributor? LH: We got very lucky in this instance. It always boils down to underlying rights and with older properties in particular, it can be a difficult proposition. 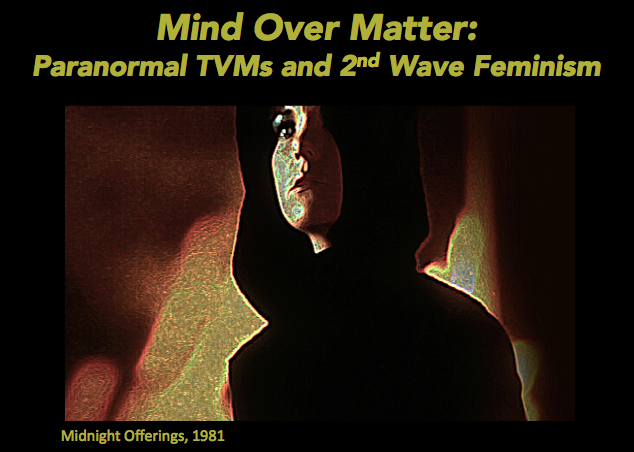 AR: Wes Craven's TVM work has largely been ignored. 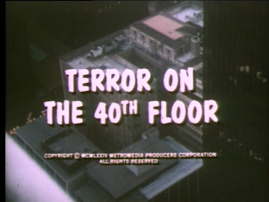 I'm wondering if you have any general thoughts on his four telefilms, Summer of Fear, Invitation to Hell, Chiller and Night Visions, and how they fit into his overall filmography? LH: I wonder about that too. I’m no scholar on the subject, but as a viewer I’ve always been of the opinion that Wes Craven’s work was smart and well-crafted regardless of the medium. I never feel like he dumbed anything down, which makes it more interesting. He was willing to go against certain horror tropes – and clearly with the Scream films had no problem making fun of them too. I think too, unfortunately because he has passed away, people are taking the time to dig in to the broader scope of his work because there won’t be any more. 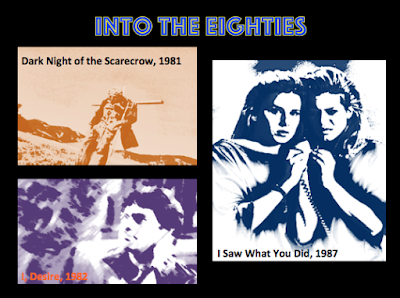 If you want to look at his work completely, the TV films need to have their due as well as the big theatrical releases. On a total side note, one of the things I love about all four of those projects are the casts. It’s totally worth trolling IMDB to see who was in all of those movies. For Summer of Fear, I knew about Linda Blair and Lee Purcell of course, but Fran Drescher and Macdonald Carey were like the cherry on top of the ice cream with the cake. Bobbi Flekman and Dr. Tom Horton in the same movie? My head just exploded. AR: I was speaking to a couple of people who work for companies that have released TV movies on DVD/Blu Ray and they said they noticed an uptick in interest in the genre. Have you noticed that as well? If so, why do you think that is? LH: I remember when the moniker “Made for TV” had a certain quality to it that people looked down upon. 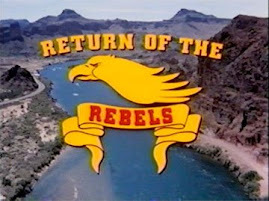 Perhaps in these days of truly excellent, original television content, viewers and labels alike are keeping a more open mind and are looking at previous made for television films with a new perspective as valid works of art. Of course, it may be driven too by people in my generation who are feeling nostalgic as well. Member Berries anyone? 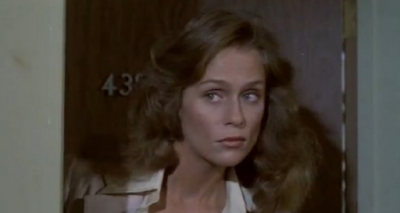 AR: I don't want you to give away anything in the interview you conducted with Linda Blair, but can you tell us how she generally looks back on the film, and maybe working with Wes? LH: Just as a point of clarification, I did not personally conduct the interview. I wish I had! I will say this, when you see the interview I think you cannot be anything but impressed with how professional she is now and how professional she was at such a young age. I wish I could be that professional now. I loved that she spoke of working with Wes Craven as if it were yesterday rather than almost 40 years ago. I hope everyone enjoys the interview! AR: Do you have plans to release any other TV movies? LH: Can I say “stay tuned” here without it sounding like a bad pun? AR: Do you have a favorite TV movie? LH: SO MANY TO CHOOSE FROM! As a Gemini, I reserve the right to pick two that come to mind right away. The Boy In the Plastic Bubble and KISS Meets the Phantom of the Park left lasting impressions. Salem’s Lot. How do you stop? Taking the small screen to the next level! I'm a TV movie fanatic, but I've been know to love everything from slasher films to Danielle Steel adaptations! 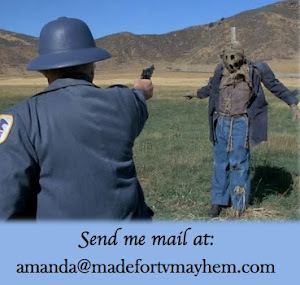 I am also a published author who has written for several websites including Retro Slashers, Film Threat, Planet Fury, Horror Yearbook, Kindertrauma and Camp Blood. I also wrote for the magazine Sirens of Cinema and my essay on Prom Night appeared in the book Butcher Knives and Body Counts. Made for TV Mayhem is my second home. 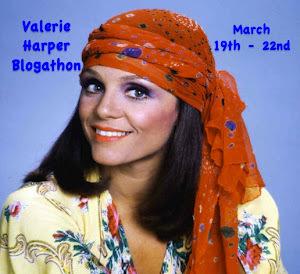 I love writing about TV movies and I hope you enjoy your visit! The MAG Down Under Variety Hour First Annual International Christmas-tacular!